The Turks and Caicos Islands are two groups of islands in the Caribbean Sea, near the Bahamas. The islands lie southeast of Mayaguana in the Bahamas island chain and north of the island of Hispaniola. Cockburn Town, the capital since 1766, is in the Grand Turk Island about 1,042 kilometres (647 mi) east-southeast of Miami, United States. The islands have a total land area of 616.3 square kilometres (238.0 sq mi). [b] and they are on a tentative list of UNESCO World Heritage Sites. The government of Great Britain is also the ruler of the Turks and Caicos, but that ruler always acts through a governor. There are local elections for premier (similar to a president). Government offices are in the Grand Turk Island. The two island groups are in the North Atlantic Ocean, southeast of the Bahamas, north of Hispaniola, at 21°45′N 71°35′W﻿ / ﻿21.750°N 71.583°W﻿ / 21.750; -71.583Coordinates: 21°45′N 71°35′W﻿ / ﻿21.750°N 71.583°W﻿ / 21.750; -71.583. The Caicos Islands are separated by the Caicos Passage from the closest Bahamian islands, Mayaguana and Great Inagua. The eight main islands and more than 299 smaller islands have a total land area of 616.3 square kilometres (238.0 sq mi),[b] consisting primarily of low, flat limestone with extensive marshes and mangrove swamps and 332 square kilometres (128 sq mi) of beach front. The weather is usually sunny and relatively dry, but hurricanes are frequent during summer. The islands have limited natural fresh water resources; private cisterns collect rainwater for drinking. The primary natural resources are spiny lobster, conch and other shellfish. The Turks Islands are separated from the Caicos Islands by Turks Island Passage, which is more than 2,200 metres (7,200 ft) deep, The islands form a chain that goes from north to south. Grand Turk. Here is the capital city, Cockburn Town, of the Turks and Caicos Islands, and all government offices are here. There is an international airport. Salt Cay. It is the second largest of the Turks Islands. The main income used to be salt, but now it is tourism. 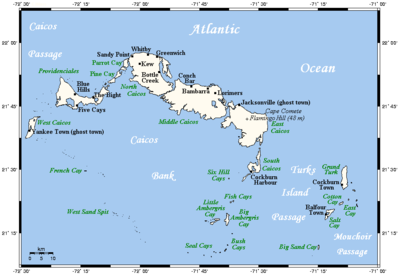 North Caicos is the largest island in the country. Middle Caicos is the second largest island in the country. South Caicos, or The Big South, is the fishing capital of the country. Providenciales, or more commonly known as "Provo". In this island is the "Providenciales International Airport" and there are many holiday resorts. A large coral reef is situated to the north of the island. Turks and Caicos Islands features a relatively dry and sunny marine tropical climate with relatively consistent temperatures throughout the course of the year. The temperature during summer rarely is over 33 °C (91 °F) and during winter rarely is below 18 °C (64 °F). Eight of the thirty islands in the territory are inhabited, with a total population in 2012 of 31,458: 16,037 males and 15,421 females. The population density is 214 persons per square mile. The official language of the islands is English and the population also speaks Turks and Caicos Islands Creole which is similar to Bahamian Creole. Due to its close proximity to Cuba and Hispaniola, large Haitian Creole and Spanish-speaking communities have developed in the territory due to immigration from Creole-speaking Haiti and from Spanish-speaking Cuba and Dominican Republic. The people of Turks and Caicos was 72.8% Protestant (35.8% Baptists, 11.7% Church of God, 10% Anglicans, 9.3% Methodists, 6% Seventh-Day Adventists), 11.4% Catholics, 1.8% Jehovah's Witnesses, and 14% other. This is a list of cities in the Turks and Caicos Islands. ↑ 2.0 2.1 Different sources give different figures for the Islands' area. The CIA World Factbook gives 430 km2, the Statistics Division of the United Nations says 948 km2, and the Encyclopædia Britannica says "Area at high tide, 238 square miles (616 square km); at low tide, 366 square miles (948 square km)". A report by the Turks and Caicos Islands Department of Economic Planning and Statistics gives the same numbers as the Encyclopædia Britannica though its definitions are less clear. ↑ 3.0 3.1 3.2 "Turks and Caicos Islands". CIA World Factbook. Retrieved 13 March 2013. ↑ "Demographic Yearbook 2011" (PDF). United Nations Statistics Division. Retrieved 30 March 2013. ↑ "Turks and Caicos Islands". Encyclopædia Britannica. Retrieved 13 March 2013. ↑ "TCI Physical characteristics" (PDF). Retrieved 13 Mar 2013. ↑ UNESCO, "Turks and Caicos Islands"; retrieved 13 Mar 2013. ↑ "Languages of Turks and Caicos Islands". Ethnologue. Retrieved 30 Mar 2013. ↑ 10.0 10.1 "Turks and Caicos Creole English". Ethnologue. Retrieved 30 Mar 2013. Wikimedia Commons has media related to Turks and Caicos Islands. This page was last changed on 29 January 2019, at 23:51.